With such significant economic activity tied to the oceans, China exerts considerable influence on the health of the marine environment. With that influence comes a responsibility to enhance environmental stewardship, one that is taking on an increasing focus in the evolution of China’s national policy. China has been a vocal supporter of the United Nations’ Sustainable Development Goals, including #14 focused on ocean conservation. This support is perhaps most tangible in China’s current five-year plan, one of the nation’s most important policy instruments. Five-year plans were once strict economic planning documents, but increasingly are weaving together China’s economic, social, and environmental development. Their influence is such that major actors in Chinese society, from government to industry to finance and beyond, shape their priorities, strategies, and investments in response to each plan. The most recent five-year plan calls for creation of an “ecological civilization” at home and abroad. Building on this mandate, environmental sustainability was a dominant theme in President Xi Jinping’s address to the recent National Party Congress. The China Council for International Cooperation on the Environment and Development (CCICED), a high level advisory body to the Chinese government currently focused on a policy study on ocean governance, is one of China’s most important vehicles for turning ambitious visions into actionable policies. 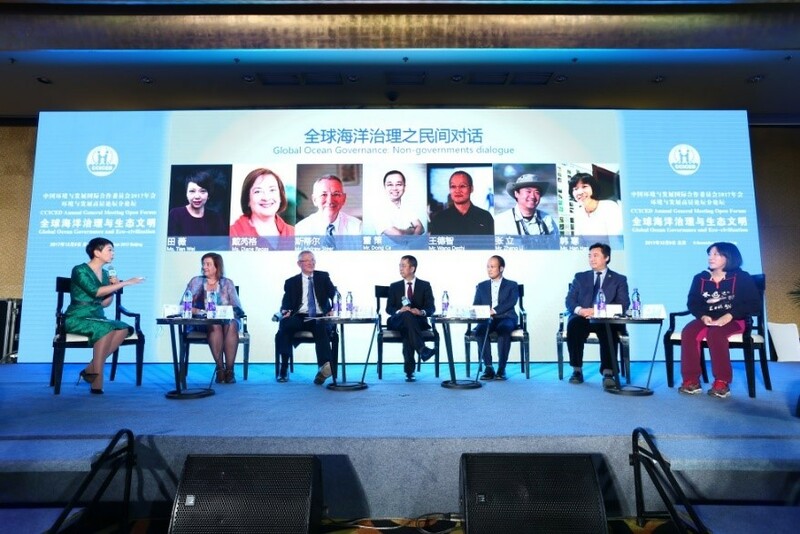 At the recent CCICED annual general meeting in Beijing, EDF and the CCICED Secretariat worked together to organize an open forum on Global Ocean Governance and Eco-civilization. The forum included a series of thematic discussions among thought leaders from government agencies, research institutes, nongovernmental organizations, and philanthropic foundations. The topics and viewpoints covered were wide-ranging and thought-provoking. Panelists addressed the very real challenges associated with China’s excess fishing capacity, substantial aquaculture development, widespread alteration and engineering of the coastal zone, and significant levels of aquatic pollution. China’s domestic fishing fleet catches in excess of 13 million metric tons, which exceeds the Ministry of Agriculture’s recommended sustainable catch by 4 million tons. Aquaculture has caused significant nutrient loading. More than 60% of coastal wetlands in China have been lost due to coastal development, land reclamation, sea level rise, and other stressors. Pollution from a variety of sources heavily impact more than 80% of the coastal zone in China. Clearly, the challenges are very real and pressing. However, the experts also saw plenty of reasons for optimism, beginning with the Chinese government’s clear commitment to growing the nation as a world leader in environmental sustainability. That commitment can yield new solutions through China’s long tradition of seeking and adapting experiences from across the globe, especially through pilot projects at the provincial and municipal level that can scale up to national policies. The recent launch of the world’s largest carbon market in China is evidence of the type of scaling the nation can achieve when it has found and effective solution. Furthermore, there are exciting possibilities for new technologies to foster a new era of environmental stewardship in China and worldwide, including tools for enforcement, research, education, and communication. For example, satellite technologies are enabling us to better track global fishing fleets, enabling improved understanding of their behavior and enforcement of high seas fishing regulations. Even China’s Vice Premier Zhang Gaoli stressed the importance of developing new environmental technologies, and using those to improve monitoring, transparency, and compliance. China has clearly made a strong commitment to environmental stewardship, and it will be exciting to see how policy, markets, science, technology, and partnerships help realize that ambitious vision. A panel of leaders from environmental and philanthropic organizations discuss new directions for ocean stewardship in China including, from left to right, Tian Wei, host of the “Dialogue” program on China Central TV, Diane Regas, Executive Director of EDF, Andrew Steer, President of the World Resources Institute, Dong Ce, President of the Qiaonyu Foundation, Wang Dezhi, Vice President of Paradise International, Zhang Li, Secretary General of the SEE Foundation, and Han Han, Executive Director of the China Blue Sustainability Institute. 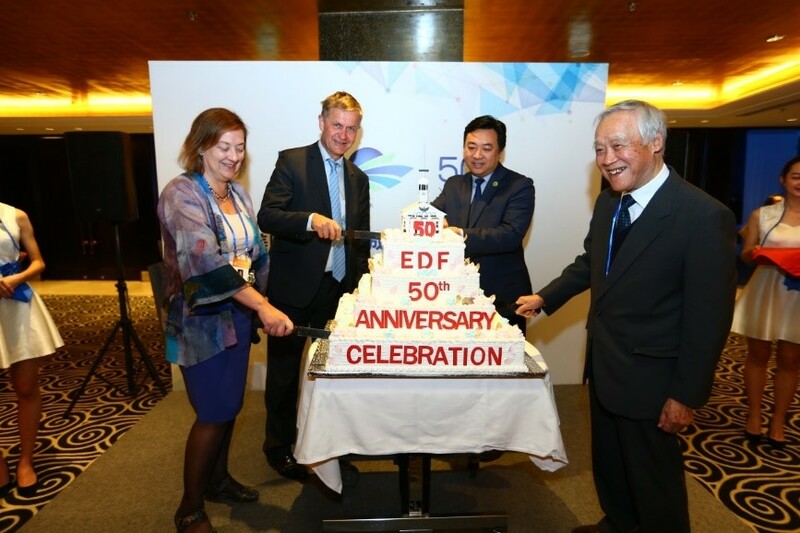 Environmental leaders from China and abroad cut EDF’s 50th anniversary cake including, from left to right, Diane Regas, Executive Director of EDF, Erik Solheim, Under Secretary General of the United Nations and Executive Director of the United Nations Environment Programme, Zhang Li, Secretary General of the SEE Foundation, and Su Jilan, Academician with the Chinese Academy of Sciences and Honorary President of Second Institute of Oceanography in China’s State Oceanic Administration. This entry was posted in International, Science/Research and tagged Asia, China. Bookmark the permalink. Both comments and trackbacks are currently closed.